Phones that are designed to be rugged often end up looking cheap, but Samsung has managed to make this one look almost classy. The rubber buttons are simple to use, and the menus are easy to access. While it lacks GPS, Wi-Fi and 3G, it does have an added microphone for noise cancellation. It even has a torch, and the handset is dust-, water- and shock-resistant. There's nothing complicated about this handset and it does a good job at being tough. Because there are no advanced, energy-draining facilities, the Solid has a long battery life - unless you keep that torch on. Yes, this is the kind of phone that can handle a fall to the floor, or being dropped into a cup of extra-strength tea. 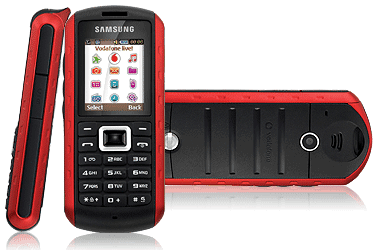 The Solid Extreme is a classic ruggedised phone - it has a rubberised case to protect it from your clumsiness, as well as bright red edges that make it easy to find. It also has some unexpected and rather unusual features and a small (1.77in), low-res screen that is kept safely behind a protective plastic lens. Unlike your average mobile, the Solid Extreme has a large loop at the top, so that it can be attached to a lanyard, as well as a lock on the back to keep its insides safe from water and damp. For added security, the back can only be opened using a coin. Samsung claims the phone is waterproof in depths up to one metre for half an hour - so if you drop it in a puddle it should be fine. We put it to the test by sitting it in a bowl of water, where it happily stayed, with its screen still on, and no signs of bubbles to suggest that any water was getting in. We decided that trying to find some scaffolding to drop the phone from (which would have been a realistic real-world test) was rather troublesome, so instead we dropped the Solid Extreme out of a first floor window onto some tarmac. We were rather nervous doing it, but the handset survived - it had a few scuff marks, which we rubbed off, and only had a small graze on its rubberized edge and a small scratch on the plastic display to show for its adventures. You could hardly notice them and the phone still worked perfectly. So what little surprises did it have in store for us? These unusual features are always a given on ruggedised phones and the Solid Extreme is no exception. Sadly, it doesn't have the compass that we used to find on Nokia's tough phones but it does have a handy torch. The LED is positioned on the top of the device, and it's turned on by a long press on the dedicated button on the side. It will remain on until you turn it off - remember this as it can drain the battery power. In the age of multimedia phones, the small screen with its 120 x 160 pixels, looks somewhat unimpressive. But it's not a multimedia phone - it doesn't even have 3G. No, that's not the purpose of the Solid Extreme. However, the display is colour and shows the time using big numbers, which is useful. Both headphones and charger fit into the same proprietary socket, although there is Bluetooth, so you could connect a set of wireless headphones if you want to listen to some tunes (though not while operating heavy machinery, we hope). If you want to listen to music, it does have expandable memory, along with an FM radio. But don't be expecting the latest operating system. There is a voice recorder, a stopwatch, games and a pretty basic image editor - as well as a 1.3megapixel camera. One handy feature is the noise cancellation faculty, which can be useful in a noisy environment such as a building site. We didn't like the fact that the central button on the navigation pad defaults to launching the browser, nor the fact that it's not easy to alter this setup. Just remember to lock the keypad when the phone is in your pocket or bag, or you could find yourself on the receiving end of a load of data connection charges by mistake. This is not the sort of flashy phone that you'll be showing off to your friends down the pub. But, if you need a phone that will stand up to a tough work environment (or just a very clumsy owner) the Samsung Solid Extreme does a good, efficient job - in fact we rather like it.